Our passage is a summary of Paul’s attitude towards the commandments of God and his understanding of the will of God. He states plainly, I myself always strive to have a conscience without offense toward God and men. This is a way of saying that he endeavored to keep his conscience clear. In other words, he strove to live without any conscious sin. Twenty four hours a day and 365 days a year, he worked to keep any sin from riding on his conscience. He wanted no controversies between him and God and he wanted nothing on his conscience about how he treated others. This verse reminds me of a story a dear brother tells of a man rolling an ostrich egg into a chicken coup to encourage the hens. What is more unsettling is the late renowned Greek scholar A.T. Robertson’s commentary on the verse: “Perfect (teleioi). The word comes from telos, end, goal, limit. Here it is the goal set before us, the absolute standard of our Heavenly Father.” Sometimes the word is tranlated as “mature,” however, God never matured so this cannot be the translation contextually. That would be Mormonism. God is, was, and ever shall be perfect. We have another challenging verse: Till we all come in the unity of the faith, and of the knowledge of the Son of God, unto a perfect man, unto the measure of the stature of the fulness of Christ. (Ephesians 4:13 KJV) Is that God saying that He is determined for us to come into a perfection like unto Jesus Christ? How can this be? As a student of Old Testament law (I speak as a fool), I took five semesters of the 613 Laws of the Old Testament. I discovered that the Rabbis had summarized the Torah into 365 negative (Don’ts) and 248 positive (Do’s) commandments, and each one had a little commentary. The 365 negative commands corresponded to one for every day of the year. A great number of these commandments are specific to Israel in the land and in service of the Old Covenant. Nevertheless, I realized very quickly that someone — someplace — could find a verse that anyone at any given time may be in conflict with. At that point, any hope of Christian perfection was for me a mere pipe dream. Obviously, my approach was all wrong. I even went as far as to start a list of New Testament commandments like unto how the Rabbis had synthesized the Torah. It was a hopeless cause. At one point I thought I would reach more commands than 613! I began to view the hope that any Christian could live in perfection or victory over sin with cynicism. Add to that certain views of salvation that left little or no security for the believer and I was confused and vexed. I vigorously fought against any notion of what is often termed as “Christian perfection.” What was wrong? I mistakenly tied the notion of perfection with assurance of salvation. That was a deadly trap. With my background in Old Testament law, and my quest to codify the New Testament, I was certain that nobody on earth, save the Lord Jesus Christ Himself, could attain such a standard of perfection as we read in Matthew 5:48 and Ephesians 4:13. I could straw-man the arguments with the best of them. Simply put, if God really demands perfection then I have no hope of salvation. To me, it was simple enough; nobody is perfect, therefore, Christian perfection is a false doctrine. Something had to give for me; it would either be a belief in perfection or the belief that our salvation is fragile (sometimes called Finney-ism). Nevertheless, God began to use people to challenge my approach. I had to first abandon the notion that our salvation was “on the line” at every second; and from there, God could show me His desire to perfect us into the image of Christ in grace and with the full assurance of salvation. As a young Christian I came across this verse; “Now the purpose of the commandment is love from a pure heart, from a good conscience, and from sincere faith.” (1 Timothy 1:5 NKJV) I then reconsidered Matthew 5:48. the emphasis there is how God loves people indiscriminately and is no respecter of persons. He sends rain on just and the unjust alike. We are to be perfect in that same sense. We are to love others like God loves them. But how? Love from a pure heart and from a good conscience. I knew about love, so I began studying all kinds of verses about the conscience. I came to understand, even then, that God wanted us to walk before him with a clear conscience. Unfortunately, my studies in theology eventually muddied this simple concept. In fact, after about 10 years the notion was far from my mind. Then one day I was challenged by a couple brothers about “walking before the Lord with no conscious sin.” I needed to keep my conscience clear before God and man. Suddenly I remembered what I had been taught of God as a young Christian. It was as if for 10 years I had been on some kind of spiritual hiatus. I resumed walking in a pure conscience and my Christian life got back on track. The conscience is that unaffiliated member of our being that God has placed within us to speak, as it were, on His behalf. It is a double or joint knowledge, namely, one of a divine law or rule, and the other of a man’s own actions. It measures our behavior and attitude against what we believe to be right and wrong, absolutely. It judges exactly as it sees without any prejudice. As designed it will judge against the laws of God written in the heart, but as men and women pour folly and falsehood into their belief system the conscience will work from that data. Whatever is sincerely held as truth will be the standard the conscience applies. The conscience in its God given form is used by the Holy Spirit to convince us of sin, righteousness and judgment (John 8:9). Truth resonates in the conscience of even the most ungodly people. The conscience is the mechanism of moral judgment that men and women pass on the morality of his/her own actions. It also passes judgment on the purity of our motives. It is the secret testimony of the soul, whereby it approves things that are good, and condemns those that are evil without partiality. The will of God is the only rule that should immediately bind the conscience. No one has authority over the conscience but God. Man can sear their conscience, but they cannot make it call evil good and good evil; nor can they cause it to lie down when it has risen to pass judgment on our behavior and/or attitude. 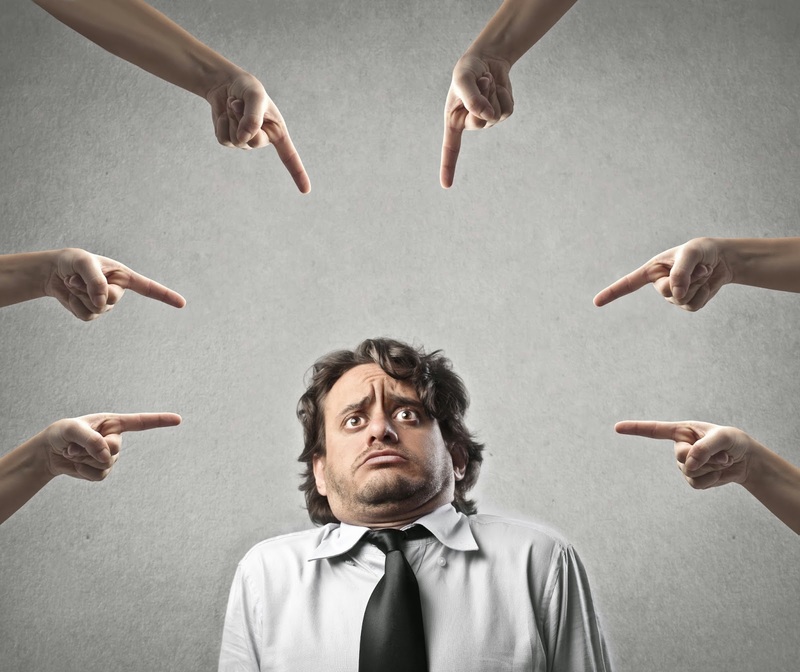 The guilty conscience is one that believes the person has acted in disharmony with what the person believes is right and wrong. A guilty conscience is a primary obstacle to us coming to the throne of grace or to do His service (Hebrews 9:9). It shouts GUILTY, which tends to cause man to want to run or hide from God. This is what Adam and Eve had done when God came looking for them. In this way man cannot act contrary to what they believe is God’s will without suffering the pain of conscience. A guilty conscience can seize upon the person like a claw upon the mind. Many criminals have confessed under duress from their conscience. The blood of bulls and of goats could not take away sins- nor did that blood have the power to PURGE the conscience of its guilt when a person had sinned. People had a sense that they had done wrong and struggled to find relief. However, we read in Hebrews 9:14, How much more shall the blood of Christ, who through the eternal Spirit offered himself without spot to God, purge your conscience from dead works to serve the living God, and again, Let us draw near with a true heart in full assurance of faith, having our hearts sprinkled from an evil conscience, and our bodies washed with pure water (Hebrews 10:22). Of an evil conscience there are several kinds. When our conscience has lost its sense of right and wrong (to some degree or another) it could be called a polluted or defiled conscience. This comes about from false criteria with which the conscience judges. The mechanism may work, but the ‘laws’ written in the heart may have been non-biblical teachings that should have been ‘cast down’ as they exalted themselves against the knowledge of God. The conscience is ‘evil’ when it gives either none or a false testimony as to past or present actions. When reflecting upon ones own sin and wickedness, if the conscience feels no pain, it is EVIL, and said to be seared or hardened (1 Timothy 4:2). This is caused by ones deliberate quenching of the Spirit of God as He would seek to bring correction to our life through the conscience. A ‘dull spot’ develops in the area that the conscience is continually quenched or seared. It is also EVIL when, during the commission of sin(s), it remains silent. A good conscience is one that has been purged by the blood of Christ and is utilizing the laws of God written upon our hearts by God, as a reference point for its moral decisions. Everyone is born with certain ‘default’ laws upon our hearts in so much as to render every human being who ever lived as guilty before God for their sins (Romans 1:28). As we grow in the knowledge of God our conscience is trained with right information and becomes increasingly effective as a guide. A weak conscience is one in which there are residual rules and regulations of men that have nothing to do with God, but yet are present in the heart and are used by the conscience to make rulings for good or evil. This is seen in great detail in Romans 14. As it is written, accept him whose faith is weak, without passing judgment on disputable matters. One man’s faith allows him to eat everything, but another man, whose faith is weak, eats only vegetables. The man who eats everything must not look down on him who does not, and the man who does not eat everything must not condemn the man who does, for God has accepted him. Who are you to judge someone else’s servant? To his own master he stands or falls. And he will stand, for the Lord is able to make him stand (NIV). This is true in all sorts of disputable matters. The issue is, does the person have a pure biblical justification in their conscience for what they are doing? If so then they are acting in faith. If a person believes that what they are about to do is sin- it is sin unto them (Romans 14:23). Why, because they cannot do it in a pure conscience. They cannot act in faith and whatsoever is not of faith is sin. A person must walk in step with the conscience until they become full persuaded in their own heart that the behavior is not a sin. This is not to say that God has a different set of rules for everyone because He does not. The issue has to do with our growth and having been built up in the knowledge of Christ (Ephesians 4:13). It takes time for God to erase things like ‘old wives fables’ and ‘legalistic laws’ and add HIS LAW in their place. There are also times when we may be vulnerable to certain sins and the Holy Spirit will CONVICT us to stay away from the things that make us fall. We must be sensitive to God and our conscience. One must not be advised to transgress the conscience, nor feel it is OK to do so. If a person thinks something they are about to do is a sin- they should not do it. We have certain traditions, as did the Pharisee’s, that make the word of God of no effect (Matthew 15:3). And that, because a lot of ‘taste not, touch not, and handle not,’ teachings exist that have cropped up in the last 200 years. As it is written, Therefore, if you died with Christ from the basic principles of the world, why, as though living in the world, do you subject yourselves to regulations — ” Do not touch, do not taste, do not handle, ” which all concern things, which perish with the using — according to the commandments and doctrines of men? These things indeed have an appearance of wisdom in self-imposed religion, false humility, and neglect of the body, but are of no value against the indulgence of the flesh (Colossians 2:22,23 NKJV). Change comes when we prayerfully spend time in God’s Word seeking to know the truth of God. It is possible for a Christian to do things in front of other Christians that they view as sin and cause them to stumble in the faith. This is very important. We read in Romans 14, Therefore let us not judge one another anymore, but rather resolve this, not to put a stumbling block or a cause to fall in our brother’s way. I know and am convinced by the Lord Jesus that there is nothing unclean of itself; but to him who considers anything to be unclean, to him it is unclean. Yet if your brother is grieved because of your food, you are no longer walking in love. Do not destroy with your food the one for whom Christ died (Romans 14:13-15). So then the summation of these things is found in Romans 14:21-23, It is good neither to eat meat nor drink wine nor do anything by which your brother stumbles or is offended or is made weak. Do you have faith? Have it to yourself before God. Happy is he who does not condemn himself in what he approves. But he who doubts is condemned if he eats, because he does not eat from faith; for whatever is not from faith is sin (NKJV). This is where believers must be conscious of the conscience of others. It is the charitable thing to do. To dismiss a sincerely held conviction of other believers is to walk uncharitably and to risk sending the message that it is ‘OK’ to transgress the conscience. Until the person can be fully persuaded in their own mind as to what is right and what is wrong, we are to bear their infirmity. The conscience has been called an internal smoke alarm; it goes off when we have done something wrong. The Christian life is to be lived out as Paul expressed it, striving to have a clear conscience towards God and men. When our conscience is clear, we have boldness towards God. However, continuing in sin will set off the conscience and unsettle us in a way that even others can sense that something is not right. If we live by this rule, we will position ourselves to be conformed to the image of Christ. If we are careless or even sear our conscience, we will never attain to the Christian character that God intends for us.